The coloration industry is a very complex domain containing many variables that can affect the outcome of the process. The number of coloration experts is relatively small compared to the size of the industry worldwide. One of the main challenges associated with the coloration process is the reproducibility of results. We believe that expert systems can be employed in the coloration industry to help create consistent and repeatable production runs. They can also be used as educational tools to bridge the gap between experts and novice colorists, and to support the decision making of experts. Correct diagnosis of the root causes of a given fault can also help facilitate the communication of color across the supply chain and reduce production and delivery times with associated savings in cost and resources. The goal of our group is to continue to develop a comprehensive expert system for diagnosis of faults in the coloration industry. Expert systems (ES) were first developed in 1960s to deal with complex problems in a narrow problem domain and may be considered a branch of Artificial Intelligence (AI). In AI the process by which humans solve problems is simulated. The basic concept involves users supplying facts or information, in the form of a query, to the system and receiving a response from the system which can be used to resolve the issue or address the query in return. The process of building the necessary knowledge is called “Knowledge Engineering”. The person in charge of the development is the “knowledge engineer”, who collects information from all sources including peer reviewed sources, text books, etc. and also interacts with human experts to obtain expert advice and knowledge from experts in the field. This process continues until the engineer is satisfied that the knowledge base corresponds well with expert opinion as well as resources available and that there are no false or redundant information within the system. The information is then expressed in the form of rules. The two main components of the system shell are the knowledge base and the inference engine which uses rules and facts to derive conclusions. 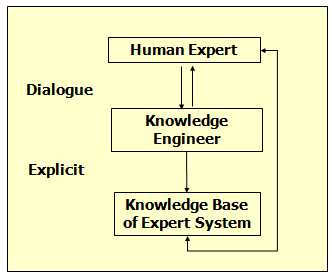 The knowledge base of an expert system may be represented in a number of ways. One common method is in the form of “If-Then” type rules, used in the development of expert systems in our group. Increased availability: The knowledge base can be available all the time, any time of the day in any location and it is also transferable. Reduced cost: The service itself is relatively inexpensive compared to human experts. Permanence: Expert systems knowledge, once developed, is permanent. Explanation: The system can provide explanations for the recommendations that it gives as well as the associated logic with such responses every single time. Fast response: Most systems have a reasonably fast response time and provide consistent & reproducible solutions for a given problem. Steady/Unemotional: Expert Systems are constructed to be unemotional, so regardless of the frequency or the time of the query the system will consider all causes pertaining to the problem based on its knowledge-base, which can be dynamically built up, and generate the best possible response. Tutorial: Expert systems can be used as tutors to train novice users. Experienced individuals can also refer to the system as a reference source to augment their knowledge or verify the root cause of a symptom. Fuzzy logic was first proposed by L.A. Zadeh in 1965 as a mathematical model to study uncertainties. 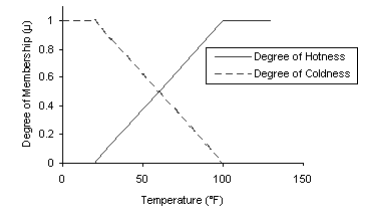 Uncertainty conditions are determined by predefined membership functions which are implemented by Mamdani’s method. In fuzzy logic values between false (0) and true (1) can be realized and thus a crisp set can be transformed into a continuous set. The elements of such sets not only represent true or false values but also represent the degree of truth or degree of falseness for each input. 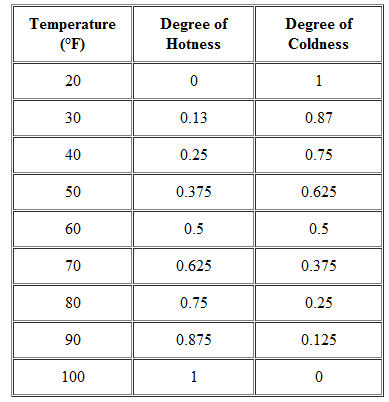 For example; let’s consider temperature. This may be interpreted as meaning 30 °F belong to the hot category by 13% and cold by 87%. Though a % here is simply a means of representing the degree of membership. We have strived to develop a comprehensive diagnostic expert system for the coloration of textile substrates since the late 1990s. The first phase of the project which started in 2000 aimed to overcome coloration problems for cotton fiber. Current members of the group working on expert system te include Weethima Sawatwarakul who is working on protein fibers and Muhammad Zubair who is working on fiber blends.